While preparing for a little hiking adventure, I had a fleeting thought to stop at the grocery store and pick up some trail mix. While I was shopping, a little lightbulb went off in my head and I realized that there was no need to purchase trail mix when I had everything in my pantry to make it myself. Then I decided to take it a step further and made some homemade granola. I have slightly adapted this recipe from Alexandra’s Kitchen. I did have to purchase one item that I didn’t have, shredded coconut, but everything else was in the pantry. Turns out the hardest thing about making homemade granola is the part where you need to leave it undisturbed to cool for one whole hour! Since I plan on eating this granola as a snack and not breakfast cereal, I used whole almonds instead of sliced almonds. Preheat the oven to 350 degrees. 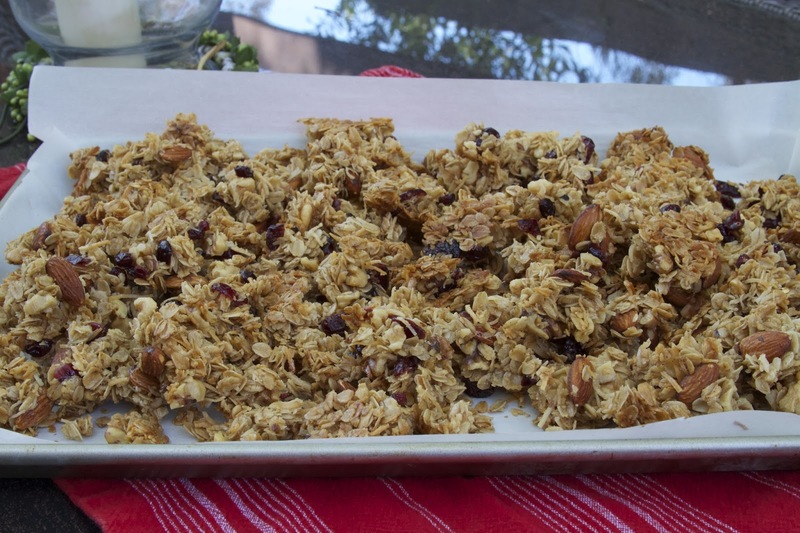 Mix the oats, coconut, nuts and cranberries together in a large mixing bowl. In a saucepan, heat the vegetable oil, honey, vanilla extract and sea salt for 2 to 3 minutes and whisk the ingredients together well. Pour over the oat and nut mixture and stir well to coat. Line a rimmed baking sheet with parchment paper and spread the mixture evenly. Bake in the oven for 20 minutes, then stir. Bake for an additional 8 to 10 minutes, checking during the final 2 minutes to make sure the coconut does not burn. Remove the pan from the oven and place entire pan on a cooling rack. Now here’s the hard part: let it cool completely for one hour! The mixture solidifies as it cools, but before then, it’s a yummy, gooey mass that’s just begging to be eaten! Try to resist! 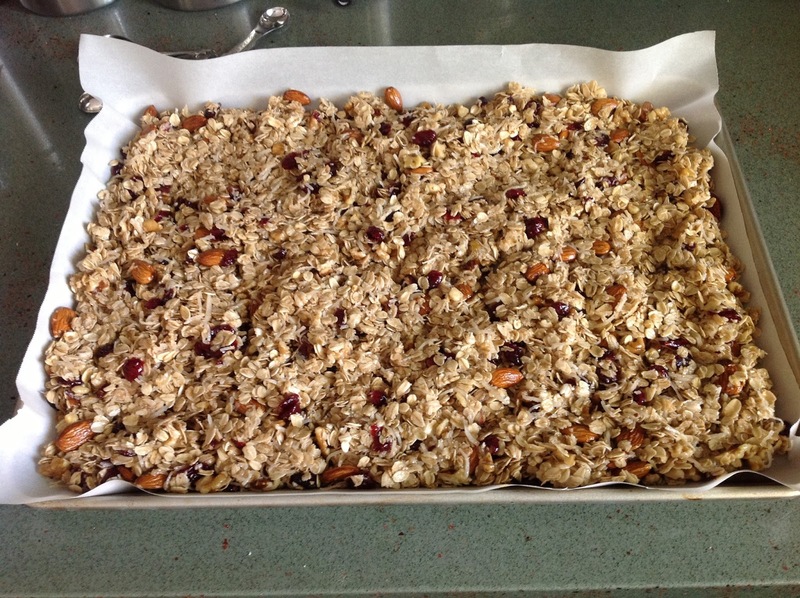 After the granola has fully cooled, break into chunks and store in a plastic zipper bag or plastic container. Previous PostWhat to do with all those squash blossoms!